Price: Varies according to size and cutting material. 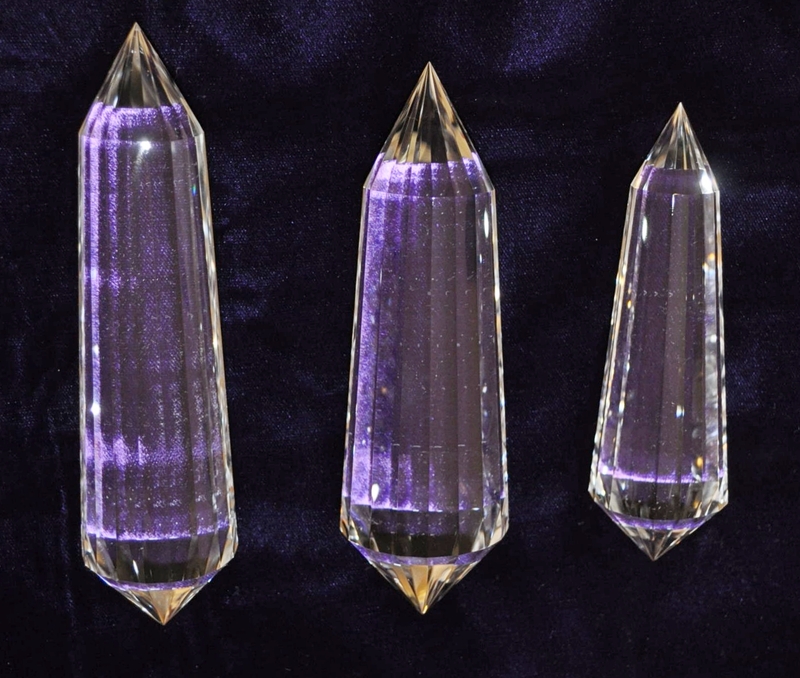 Double tetrahedron crystals cut from flawless, natural Brazilian quartz crystal; or alternatively, cut from colorless, Russian laboratory grown quartz. Energized with Shen-Ion Harmonik frequencies using Vital-Energi® technology. Suitable for time travel and Mercaba meditations, self-healing, energy clearing, reprogramming DNA, realignment of chakras, and alchemical manifestation. Vogel style healing/meditation crystals with 18 sides, double terminated, cut from extremely rare optical quality, flawless, colorless, natural Brazilian quartz crystal. The Brazilian natural quartz rough was personally inspected and hand-picked by Stephen Quong. Very highly energized with Shen-Ion HarmoNIK frequencies using Vital-Energi®nano technology. Excellent choice for meditation, self-healing, lucid dreaming, astral travel, and exploration of metaphysical dimensions. Left: 14.5 ounces, 6-3/4 inches length, 1-3/4 inches wide at base, 1-3/8 inches wide near tip. Price: $988 USD plus applicable tax and shipping. Middle: 15.9 ounces, 6-3/8 inches length, 2 inches wide at base, 1-1/2 inches wide near tip. Price: $988 USD plus applicable tax and shipping. Right: 8.5 ounces, 5-3/8 inches length, 1-5/8 inches wide at base, 1 inch wide near tip. $688 USD plus applicable tax and shipping. Price: $1008 USD plus applicable tax and shipping. Please call (925) 754-8858 during business hours Pacific Time, or email: smquong@gmail.com to arrange payment. Vogel style meditation crystal with 48 sides, double terminated, cut from near flawless, colorless, natural Brazilian citrine quartz, with beautiful, subtle veil and phantom inclusions. Very highly energized with Shen-Ion HarmoNIK frequencies using Vital-Energi® technology. Excellent choice for meditation, self-healing, lucid dreaming, astral travel, and exploration of non-physical dimensions. Price: $800 USD plus applicable tax and shipping. Vogel style meditation crystal with 24 sides, double terminated, cut from near flawless, pale yellow, natural Brazilian citrine quartz. Energized with Shen-Ion Harmonik frequencies using Vital-Energi® technology. Price: $988 USD plus applicable tax and shipping. Price: $888 USD plus applicable tax and shipping. 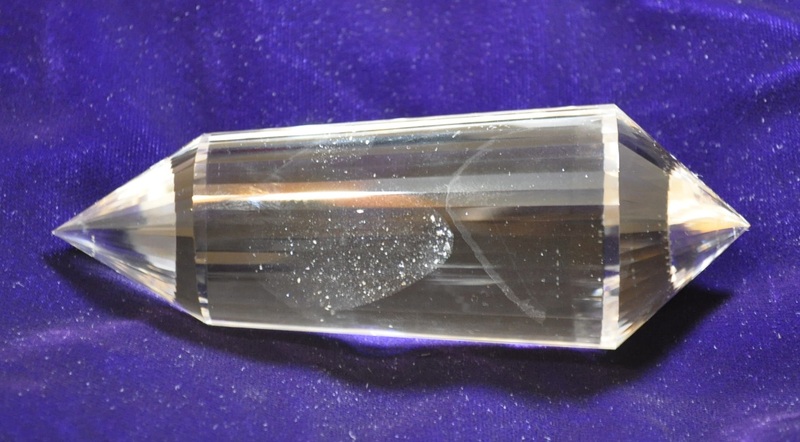 A custom-cut Vogel style meditation crystal with 13 sides, double terminated, cut from Siberian blue laboratory grown quartz. Energized with Shen-Ion Harmonik frequencies using Vital-Energi® technology. A custom-cut Vogel style meditation crystal with 13 sides, double terminated, cut from Madeira Orange color laboratory grown quartz. Energized with Shen-Ion Harmonik frequencies using Vital-Energi® technology. Price: $3,000 USD plus applicable tax and shipping. To purchase, please call (925) 754-8858 during business hours Pacific Time, or email: smquong@gmail.com. 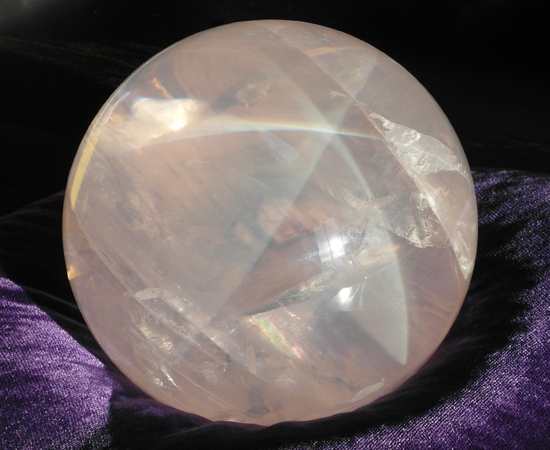 Madagascar Rose Quartz Sphere with natural six-pointed star. Beautiful and extremely rare! Comes with custom-made, imitation suede carrying case. According to Qi-Mag Feng Shui, this talisman is an ideal choice to energize the Heart Point of a home with peaceful and loving energies. Designed and cut by Drew Tousley of Luminary Studios. Cut from the finest quality, near-flawless, colorless, Brazilian natural quartz crystal. 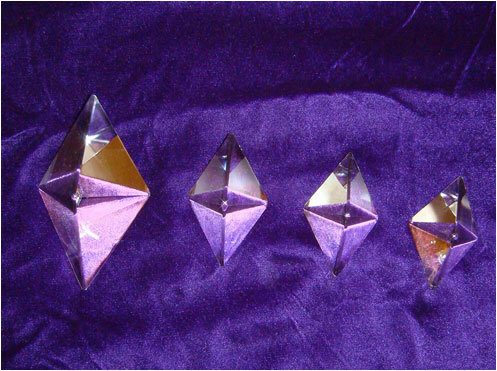 Holding this crystal in your left hand when meditating will help you attune to the Angelic Realm of Consciousness. Weight: 9.4 ounces. Height: 5-1/8 inches. Width: 1-7/8 inches near base; 1-3/8inches near top. Price: SOLD! Please call to order a similar crystal. Please call (925) 754-8858 during business hours Pacific Time, or email: smquong@gmail.com for a similar item. Designed and cut by Drew Tousley of Luminary Studios. Top part is cut from 95 percent flawless, colorless, Brazilian natural quartz crystal. Bottom part is cut from natural Brazilian amethyst. 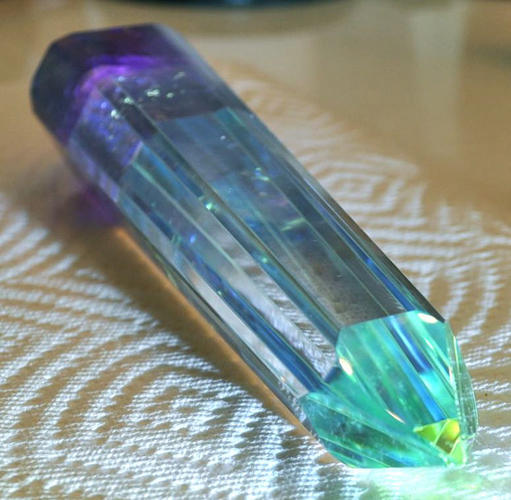 A piece of blue-green dichroic glass is glued between the top and bottom parts, resulting in the internal reflection of blue-green light at the tip. Includes a custom-fit, blue-green, imitation suede carrying case. Weight: 13.7 ounces. Height: 6-7/8 inches. Width: 1-3/4 inches near base; 1-1/4 inches near top. For meditation, spiritual healing, shamanic activation rituals. Designed and cut by Drew Tousley of Luminary Studios. Top part is cut from 99 percent flawless, colorless, Brazilian natural quartz crystal with internal phantom point. Bottom part is cut from natural Brazilian amethyst. 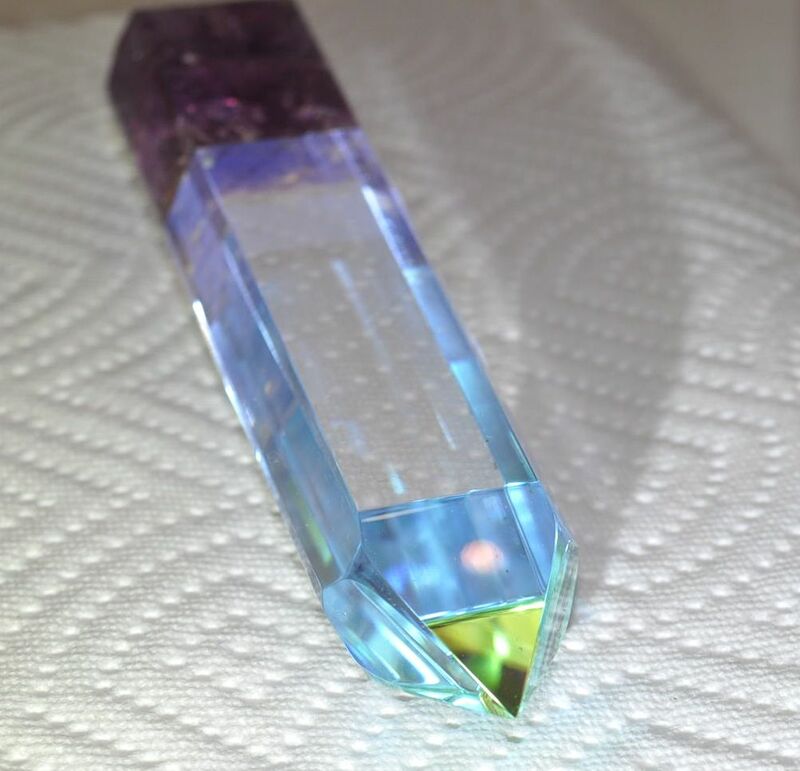 A piece of blue-green dichroic glass is glued between the top and bottom parts, resulting in the internal reflection of blue-green light at the tip. Includes a custom-fit, blue-green, imitation suede carrying case. Weight: 9.2 ounces. Height: 7-1/8 inches. Width: 1-1/2 inches near base; 1-1/8 inches near top. For meditation, spiritual healing, shamanic manifestation rituals. 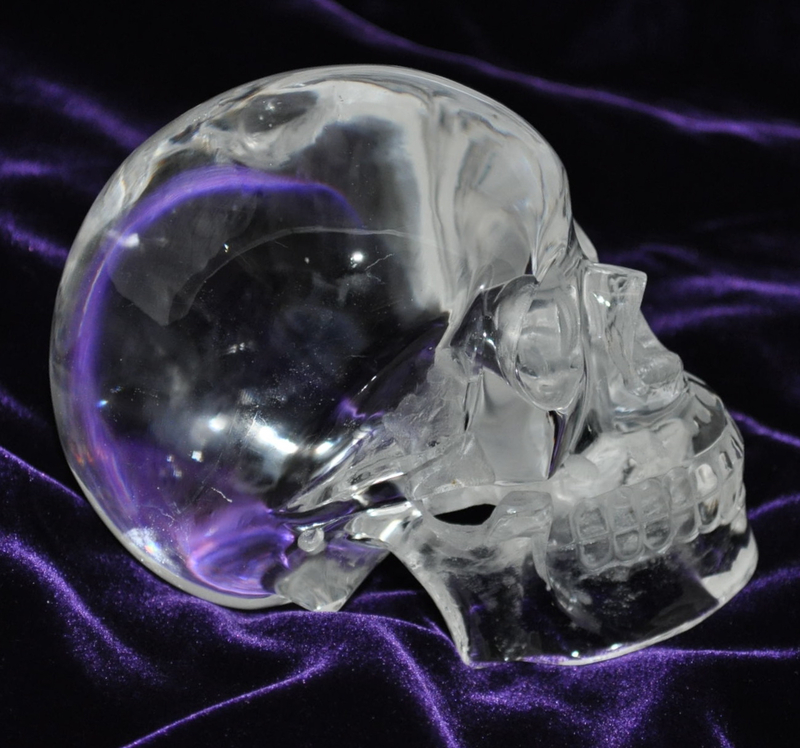 Quartz crystal skull, cut in China from colorless, flawless, Russian laboratory grown quartz. Suitable for time travel, accessing information from other dimensions, reading akashic records, etc. Price: $250 US Dollars, plus any applicable sales tax and shipping. 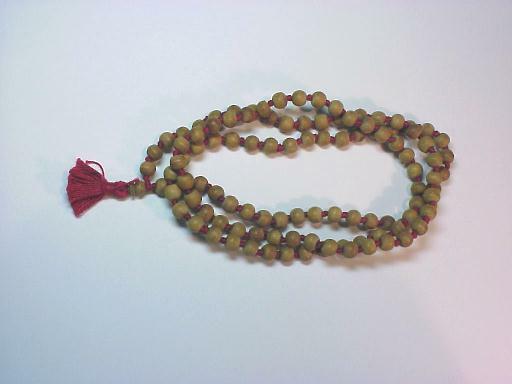 Rosary of 108 beads made from the seed of a tree which grows in the Himalayan Mountains. Considered sacred to devotees of Lord Siva and the Divine Mother. AAA Quality, 8 mm diameter, polished, matched sets. Knots tied by vegetarian devotees in Haridwar, India, and dipped in the Ganges River. Price: $40 US Dollars, plus any applicable sales tax and shipping. 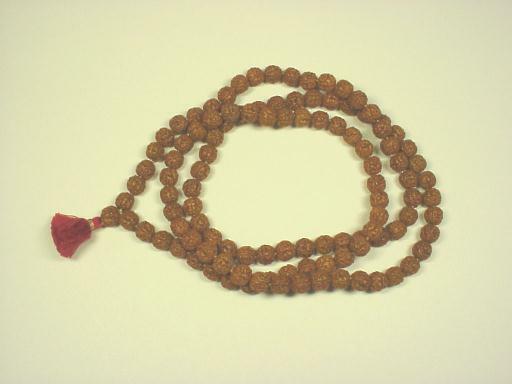 This hand-made Rosary has 108 beads of the finest quality sandalwood from Mysore, South India. Sandalwood is sacred to the Goddess Lakshmi. Size: 8 mm diameter, knotted with red Dacron thread. Each bead has been dipped in the Ganges River at the most sacred Har-ki-Pauri bathing ghat, before being strung by vegetarian devotees.